Interested in Becoming a Diamond Pier Retailer? The Diamond Pier Foundation System is quickly spreading across the United States as the preferred foundation of professional builders. More stocking retailers are coming on board every day. You don’t want to miss out on this growing product. 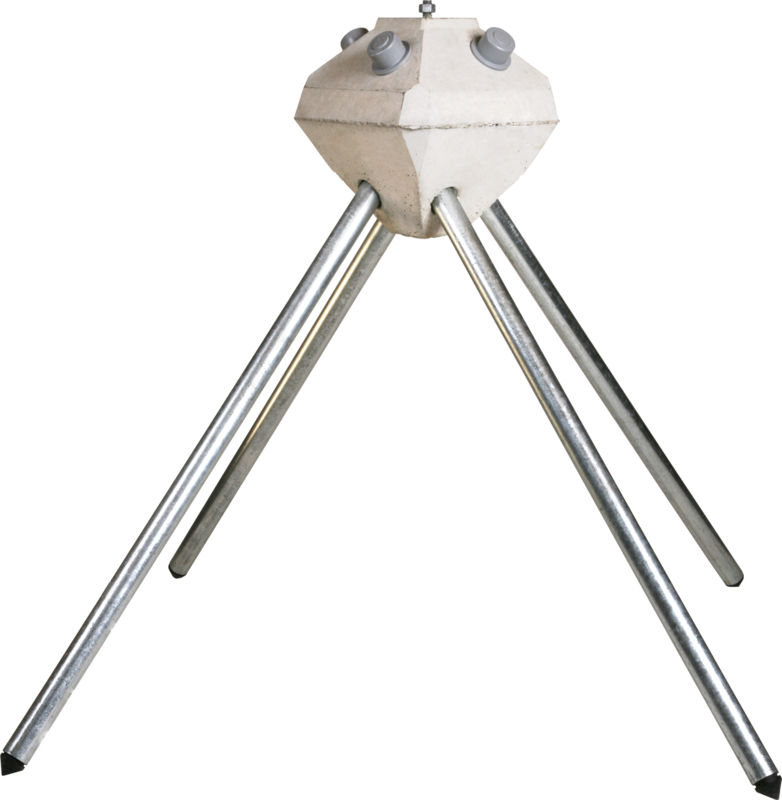 The Diamond Pier footing requires no digging and is code compliant and structurally rated. Contractors all over the U.S. are praising the Diamond Pier foundation system for changing the way they build decks and increasing their overall profitability. The Diamond Pier foundations will arrive to your store on a pallet as seen to the left. A full skid of DP-50/50” contains 45 piers, and a full skid of Diamond Pier DP-75/63” contains 24 piers. The pins are neatly assembled in the attached crate below making for easy accessibility. Attached to each Diamond Pier head is a baggie with 4 inspection plugs, and 4 pin caps. 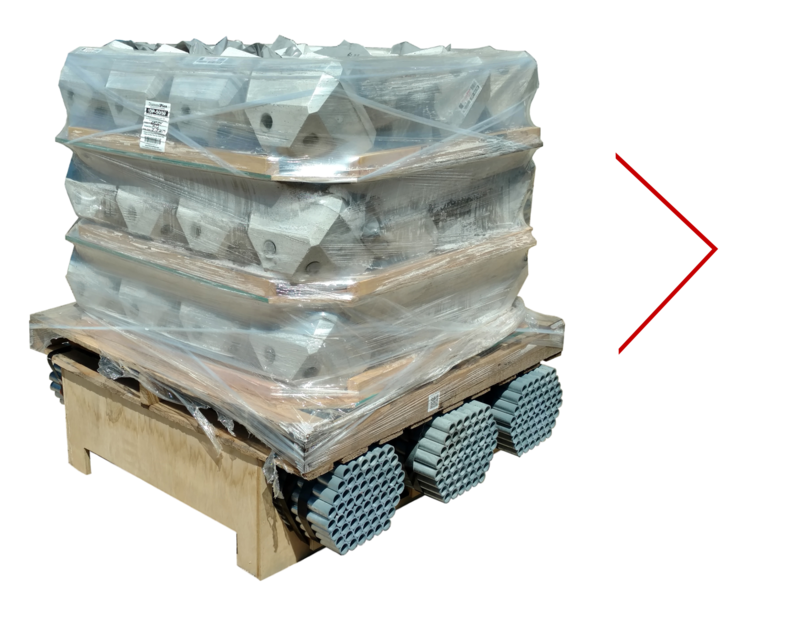 Each layer of concrete heads is protected with a safety ledge to make transporting the Diamond Pier pallet as safe as possible. Pin Foundations wants to set you up for success. That’s why we offer a New Stocking Retailer Program that offers a free Driving Bit and free website listing when you purchase a full skid of Diamond Pier DP-50/50” (45 piers) or a full skid of Diamond Pier DP-75/63” (24 piers). The promotion is limited to “New 2018 Active Stocking Retailers." You’ll also receive some great marketing materials to promote sales! 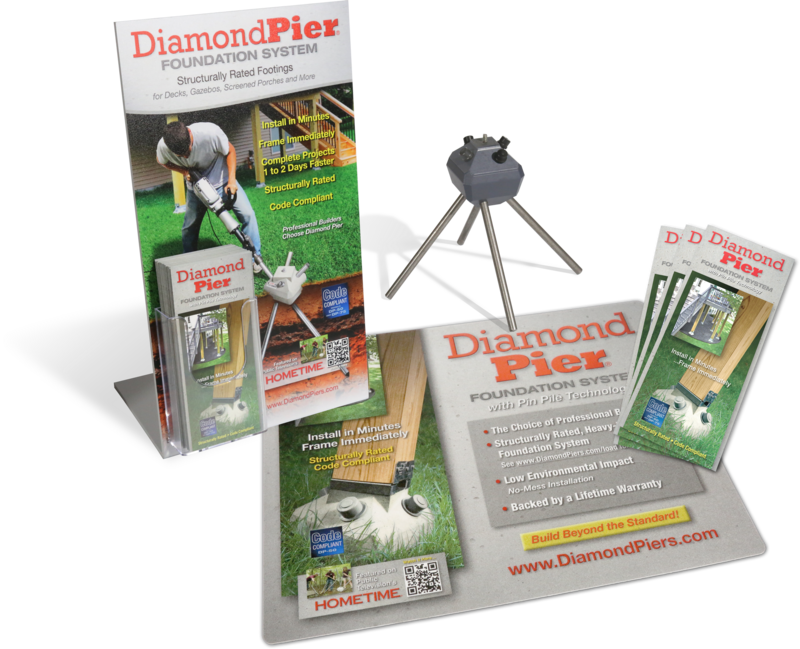 Diamond Pier Marketing Kit: As pictured to the left, stocking dealers will receive a counter mat, counter display, and tri-fold brochures with their first order of Diamond Piers foundations. You can also order special promo items on our order page! Fill out the form below to become a 2018 New Stocking Retailer! Diamond Pier Driving Bit, FREE for New Stocking Retailers. Have a Diamond Pier rep contact me. Send me your SKU list with UPC codes.